We are delighted to announce that Newport County Council has gone live with The WCCIS. This is the eleventh local authority that has gone live since the launch of The WCCIS in 2015. It allows access to relevant information on the care provided to a range of health and social care professionals, to show where a patient is with their treatment. 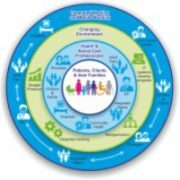 When fully implemented across Wales, WCCIS will help break down barriers caused by different organisations using different IT systems, by securely storing important information covering a range of activities such as community nursing, health and social care visits, mental health, learning disabilities, substance misuse, complex care needs and social care therapy.